Heroes of Might and Magic V is a turn-based strategy video game fully rendered in 3D and the game art features classic fantasy creatures in an epic world setting. The story arc is covered in the original Heroes of Might and Magic V game and two expansions, Hammers of Fate and Tribes of the East. A significant sidestory is explored in greater detail in the first-person fantasy role-playing video game Dark Messiah of Might and Magic. 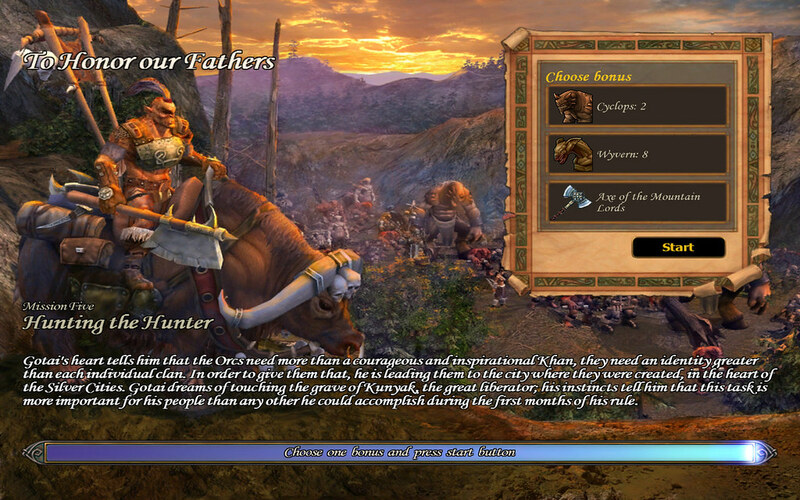 This page has fantasy art, game scenes, cutscenes, and gameplay movies from Heroes of Might and Magic V: Tribes of the East - campaign 2 "To Honor Our Fathers" mission 5. The opening cutscene for this mission shows the false queen unveiled as the succubus Biara. The events leading up to this appear at the end of Campaign 1 Mission 5: Heart of Darkness, and we have included it here for convenience as the first movie in the YouTube playlist. The second movie in the playlist is the one that starts this mission.